When the Salt Lake cleanup hitter got called up in July 1995, Steve Dunn stepped into his spot in the batting order, according to The Deseret News. He also quickly made himself at home, going 2 for 4 in one game, knocking a home run. "I like hitting (in the cleanup position)," Dunn told The News. "It's definitely a big RBI spot and I wanted to see what I could do there." Dunn had already had a shot to see what he could do in the majors, a year before in Minnesota. Later in 1995, he got another shot, five final major league appearances to round out his big league career. 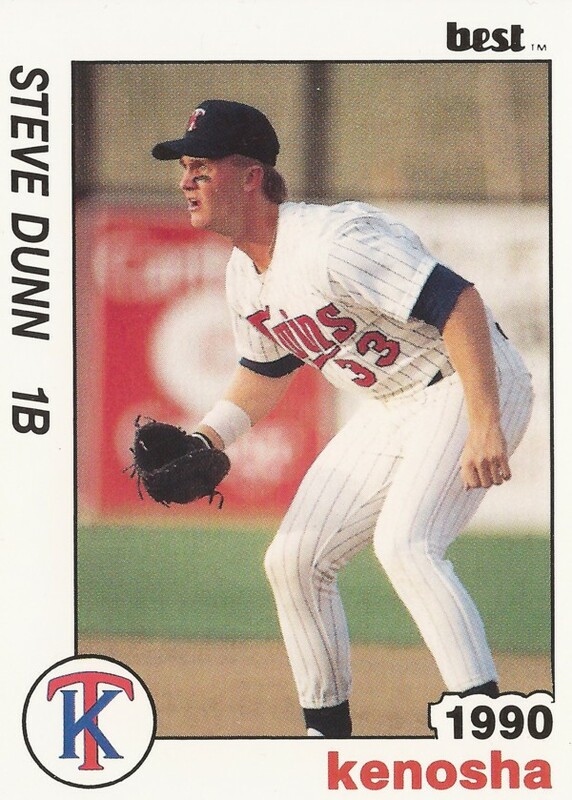 Dunn's career began in 1988, taken by the Twins in the fourth round of the draft out of Robinson High School in Fairfax, Va.
Dunn started with the Twins at rookie Elizabethton. In 26 games, he hit .284. He played 1989 between Elizabethton and single-A Kenosha. He returned to Kenosha for all of 1990, hitting .297, with 10 home runs and 72 RBI. He then played 1991 and 1992 at high-A Visalia. In his second season at Visalia, he hit a career-high 26 home runs. Dunn made AA for the first time in 1993 at Nashville. He hit .262, with 14 home runs there. He then made AAA Salt Lake in 1994. In May 1994, he made the majors. 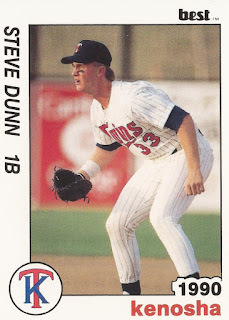 With the Twins in 1994, Dunn got into 14 games, picking up eight hits in 35 at bats. He also knocked in four runs. Dunn returned to Salt Lake for 1995, hitting .316 in 109 games. That September, he got his call back to Minnesota. In five games, he got six at bats. He walked once but didn't get a hit. One more season at AAA in the Indians organization and Dunn's career ended after nine seasons as a pro.